Also, and this goes out to the new Lenfald members: I do not check the CIC thread regularly, so if your CIC has been approved and your name isn't among the list PM me. LC is coming up soon guys, so get your bricks ready! Your welcome, all! Enjoy it! Only myself and Soccerkid6 are on there and Loreos has at least 8. Doesn't take that long to load in your MOCs if you know how to grab the image URL. CAUTION: Double-check your work first; I made a -3 point error for my CIC and currently there's no way to fix it that I know of. Loreos is releasing their LC tomorrow morning Eld. Can't let them beat us! Seriously though, can't wait to see what you have planned for our LC, already got some ideas in the pot. This is my first freebuild for march. 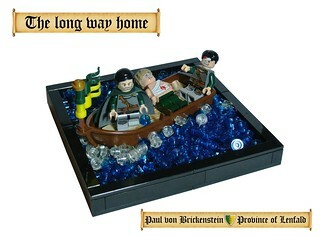 Paul von Brickenstein is on his way back home from the Magic Islands. There is also a short story at flickr and the GC3 Conclusion thread. Elderon wrote: Do NOT send me a PM with every freebuild you make. Show your character helping in fortifying a city, house or ruin to defend them from enemy forces! And as you might remember not every city or keep has overcome the hard times after our civil war, so aid where-ever possible! The build must include your character. No size limit, but as always Quality over Quantity. Every entry will receive 4 points. An honorary mention will grant you an extra 4 points and a Forest Maiden figure (without the bow or shield) and a personal letter from our High Lord Triphian I. First place will grant you 6 extra points and a micro-scale version of Tehereans Fortress on the Magic Isles, as well as the honorary title: Great Defender of Lenfald and a personal letter from our High Lord Triphian I. Post your entry in the official Lenfald thread along with a link to it, PM’s will not be counted. Questions about the LC should also be posted in the thread. Last edited by Elderon on Mon Mar 25, 2013 9:08 pm, edited 2 times in total. Great, relevant idea for a LC there, and with an extended weekend ahead I might just get around to building already. Awesome prices as well. Have fun building, everybody, for Great Lenfald! Teherean wrote: Great work Elderon, Frisky. I'll be checking in as a regular member sometimes, but not often anymore. It seems that Elderon is ready and set to get going with his work as Lenfald FO.